After directing this year's fantastic The World's End (which was my favorite comedy and also #10 on my favorite films of the year), Edgar Wright is busy getting Ant-Man ready to arrive in 2015. We already know that Paul Rudd is taking the superhero role in the Phase Three title at Marvel Studios, but we're still not sure what version of Ant-Man will end up on the big screen. There are several different versions in the Marvel comic book universe and only rumors have swirled about which one we'll see. Now a photographic hint from Wright himself, doing what he calls "homework" for the film, gives us a little insight into the plot. ComingSoon points out that the above photo is from the animated series "Avengers: Earth’s Mightiest Heroes." More specifically, that screenshot is from an episode called "To Steal an Ant-Man," based on the issue Marvel Premiere #47. In that storyline, Scott Lang steals the Ant-Man suit created by Hank Pym to commit a crime, but he decides to do good instead of just being a criminal, and in turn becomes the new Ant-Man, with the support of Pym. They also point out that many years ago, Wright told Superhero Hype, "The idea that we have for the adaptation is to actually involve both… Henry Pym and Scott Lang." Since we don't know specifically which Ant-Man that Rudd has been cast to play, he could be either character. But we're betting that Pym will be the more minor role and will be played by an actor who will hand the reigns over to Rudd as the thief turned good guy. After all, Feige has also called Ant-Man a heist film, which would make this story the perfect fit. Of course, it will be the specifics of how this story plays out within the confines of what has already happened in the cinematic Marvel universe that will change things up. 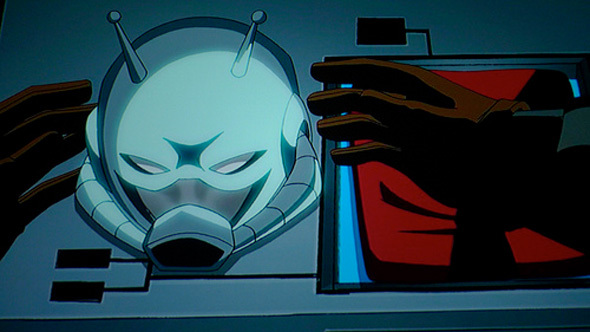 Will both Hank Pym and Scott Lang see big screen action as Ant-Man? We'll find out soon enough. Can't wait to see Rudd in the uniform. So, if both Lang and Pym are o be in it, does that mean we get Yellowjacket as well?